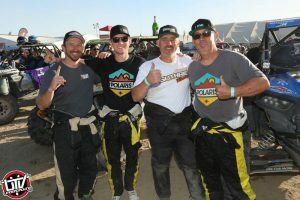 One of the most grueling off-road races on the calendar, the King of the Hammers combines an 80-mile desert racing course with several rock crawl sections. A test of both man and machine, both racer and UTV have to be perfect to win. Guthrie, Jr. spent a good deal of his young life co-driving for his father in the storied event and was a big part of the elder Guthrie’s record six victories in the UTV class. For the Guthries, racing is a family sport. They wrench together and they race together. After qualifying fifth, Guthrie, Jr. made quick work getting to the front, finally taking the lead for good in the Sledgehammer section. The car held up perfectly and expert driving made sure they didn’t have to get out and winch. The Guthries have been running Polaris RZRs pretty much from the beginning. Guthrie, Jr. said the RZR Turbo combines the best of everything for the KOH course. A lot of people shrugged when Guthrie, Jr. showed up to the race with a set of ITP Blackwaters on KMC wheels. The tires, designed as a mud tire, showed up the naysayers as provided great traction in both the desert and the rocks. Guthrie, Jr. was also running a new set of KMC wheels here. Narrower in profile and super durable, the KMCs carried the day through the race with no failures. Factory UTV provided half-inch UHMW skid plates and Super ATVs axles never gave up. Though they didn’t need it, Guthrie, Jr. was glad to know he had a WARN winch. Guthrie, Jr. will return to the Best in the Desert Series for the Mint 400. That race is scheduled for March 8-11 in Las Vegas.